Our Master of Arts (MA) in Community Music is an interdisciplinary program that balances theory and practice for the development of leadership skills in community music. During this program you’ll complete an applied community service placement and a research project. The final requirement is a presentation of your research in a public community setting where your leadership is demonstrated in context. The MA in Community Music is offered full-time and part-time. Our program is designed for community leaders who are, or plan to be, engaged in creating or making music with diverse populations in schools, places of worship, private studios, seniors’ homes, community centres or other venues where music making occurs. Those who are currently in music careers will find this program tailored to the deepening of their skills and interests through scholarship and applied experience. 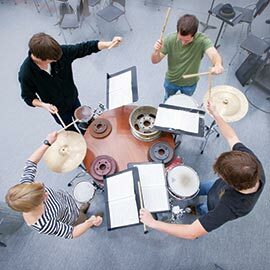 Those completing undergraduate programs will find this to be a natural progression that builds on the foundational experiences and developing musicianship acquired in their undergraduate years of study. Full-time students will normally complete the curriculum in three consecutive terms (Fall–Winter–Spring/Summer). As a part-time course of study, the program is designed with flexibility in both sequence of courses and duration of program. The part-time program has a typical duration of 6 terms. *You can develop your program in consultation with the graduate coordinator. A four-year honours degree or equivalent. Minimum B in your final two years of full-time undergraduate program of study. Applications from a diverse range of disciplines are welcome, but a foundation of musical training and experience is required for admissibility to this program.